NordicTrack SpaceSaver SE7i Review by Industry Experts! The NordicTrack SpaceSaver SE7i Is On Sale! It has Hassle Free Assembly. It easily Folds Upright for Storage. Its Commercial Grade Ergonomic features. Its impressive Service Record for the price. 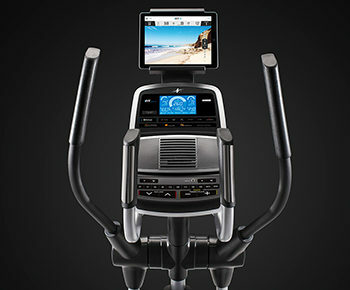 The NordicTrack SE7i is, in our opinion, one of the top 3 “Best Buys” at the competitive $999 price range. At that price range it is the most innovative, offering exceptional interactive and motivational technology. WEEKEND SALE ENDS MONDAY: The NordicTrack SpaceSaver SE7i is reduced to $999 with Free Shipping. No interest financing available. Less moving parts to cause potential service issues. It delivers a more ergonomic elliptical path that closer resembles a natural stride. It’s has a more stable and solid feel. The disadvantages of the rear drive is that it can be awkward to mount and can often take up more space. NordicTrack SpaceSaver SE7i – This machine inclines from 0 to 8 levels. accelerate and decelerate, causing stress and strain to the joints. With the NordicTrack SpaceSaver SE7i you’re getting an incline feature that’s found on ellipticals that cost thousands of dollars. Snap Assembly — Having done our share of assembling fitness equipment, we can say it’s generally a terrible business than most often takes two people and at least two hours. The NordicTrack SpaceSaver SE7i only requires three simple steps to assemble! iFit Live Coach Ready— The problem with any form of exercise is getting motivated, and it’s even more difficult to get motivated when you exercise indoors. iFit Live is a major game changer in motivational technology. The SE7i is listed as iFit “Coach Ready” and has a 5″ back-lit screen. This means that you can use the iFit Features as long as you have wireless internet in your home. You will also need a smart device (tablet, laptop, or smart phone) to view the running routes while you exercise. 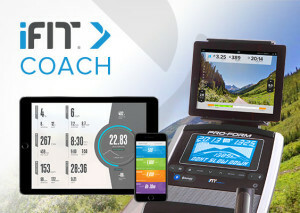 iFit Live is available on both NordicTrack and ProForm machines. includes your physical stats and your fitness goals. You can then select a personalized workout designed by professional personal trainers like Jillian Michaels. The program will control the resistance and incline, while providing audio coaching. In addition to personalized workouts, iFit Live allows you to map your workouts with Google Maps™ and your elliptical will incline/decline to the contour of the land. In addition to mapping your own route, iFit Live has a library of famous routes through popular cityscapes or national parks. You should note that there is an additional cost for iFit Live. 24 Workout Programs — If you don’t want to spend the money for iFit Live, the NordicTrack SpaceSaver SE7i comes with 14 installed workout programs. This is a generous selection in comparison to other brands and models of elliptical trainers. Cooling Fan — The fan actually provides some relief and optimally points at your core. This is a very popular feature with customers. Speakers and MP3 Input — The speaker system is better than you will find on most fitness equipment. Adjustable Oversized Cushioned Foot Pedals — The large foot pedals allow you to position your feet in the most comfortable position. You can also adjust the angle of the pedals so you don’t have to lift your heal to meet the pedal. These features reduce stress, strain and numbness to your feet. Folding Storage — This version of the NordicTrack SE7i elliptical is also designed for space saving storage. When folded and placed upright the machine has a footprint of only 32″ x 28″. 18 Lb. Flywheel — A decent weight for around a $1000 elliptical. It gives the elliptical motion a smooth, natural feel as if you are running in the air. NordicTrack SpaceSaver SE9i – Read our full review here. The SE7i is the replacement model of the NordicTrack AudioStrider and, like its predecessor, it’s an impressive machine. The power incline and variable elliptical stride make this an appealing offer. The addition of iFit Live makes it even more attractive. The SpaceSaver SE7i comes with an 18″ stride length so if you’re above average height then you should consider a model with a 20″ stride like the Sole E95. So, is the NordicTrack SpaceSaver SE7i the best built elliptical trainer for $999? There are other models that are comparably built. 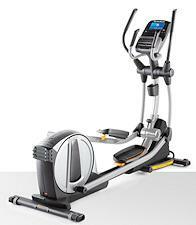 However, when you factor in the extensive range of features and the unique Precor patented designs, the SpaceSaver SE7i rates a “Best Buy” and is an excellent value at $999! If you’re willing to spend an extra $800, you can get an improved 7″ Smart HD Touchscreen, stronger warranty, and additional programming on the SpaceSaver SE9i. 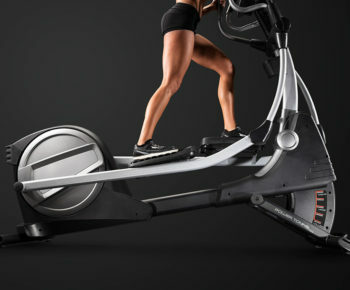 Check out a full comparison chart of NordicTrack ellipticals here. Wow- I can not say enough great things about the 2015 version of the NordicTrack AudioStrider 990. This machine is incredibly engineered and well made, in addition to being most fun to use. I spent several months comparing hundreds of ellipticals and must say that nothing else even comes close>>>excellent quality as well as my customer service experience with NordicTrack. This machine is truly built to last and will help me with my weight goals including great toning and better overall health. You will not regret your purchase of this machine, and trust me, as I am very analytical and have to applaud NordicTrack for their tremendous strides in quality improvement, making for a very happy customer. This machine is the best value in the marketplace, period…nothing comes close. I’ve had my Nordic Track for 7 weeks. The ordering & delivery process was smooth – I ordered it online and applied for the payment plan. I received a $4000 line of credit from Icon fitness, which covered the Nordic Track and is able to be used at all Icon companies. Nordic Track contacted me within 6 hours to confirm order and to sell me the 4 year warranty for the same price that the 3 year was listed as on the original sale website. I ordered the elliptical on Tuesday night and it was delivered to my house by Old Dominion freight on Friday – the distribution center was only 100 miles from my house, so that delivery time might be atypical. The box did have some damage on delivery – it appeared to have been punched by a forklift tine at some point. The product inside wasn’t damaged – the pieces were packaged in Styrofoam inside the box so it cushioned them from the fork. Assembly took longer than the manual estimated and definitely takes two people. As we were assembling we discovered that the plastic cover over the front leg where you attach the incline mechanism was assembled a little off track – where the two halves snap together at the front of the shaft the sides weren’t aligned properly so the locking tabs were on the outside inside of locked into the slots on the inside. The cover was bolted down securely and the incline ramp hasn’t been impacted. All the parts were present and clearly labeled. The unit has been used almost every day at least once, sometimes twice, by both myself and my husband. I weigh 125 (130 at the time of delivery), he weighs 231 (238 at the time of delivery). When I first started using the unit it was very quiet. Once my husband starting using it I started hearing a clanking noise in the right leg where it hooks onto the flywheel. The screw also worked loose in the right foot pedal. I tightened the screw and the noise there stopped. The flywheel/leg clanking has not stopped – this model does fold up so those clips can release from the flywheel allowing the legs to fold. I have tried to tighten the clip on that side but there are no parts to adjust. I haven’t noticed an impact in performance and the sound has quieted considerably in the last several weeks of use. The operation is smooth and I have had no trouble with resistance or incline changes. The footpads are large and comfortable, even for my husband. The heart rate monitor has been accurate, matches to my polar monitor most of the time. The programs are nicely done and have good variety. The only minor annoyance is that it beeps every minute, even if the resistance isn’t changing at that section of the program. Overall, I’m very pleased with the performance so far. My previous elliptical broke after three months (ProForm Cardio Stride), so I’ll see how this one is doing at that point and send an update. Hello. I am shopping for an elliptical and I have a concern. I am on the shorter side, 5’1″ and 130 lbs, and I am concerned about how tall the handles are (will I be reaching up to grab handles?) and my stride length. Do you think this product will fit me with my size? If this one doesn’t work for my height, do you have an elliptical that does? Thank you for your help. Happy Thanksgiving. The NordicTrack SpaceSaver SE7i is designed for an average height female which is around 5’3″. You may have to reach up slightly but nothing that’s going to be awkward or uncomfortable. Let me know if you have additional questions.